During October last year, my wife and I spent 6 days in Paris. Looking back at the trip, makes me realise how amazing Paris is as a city, which makes me miss it even more. 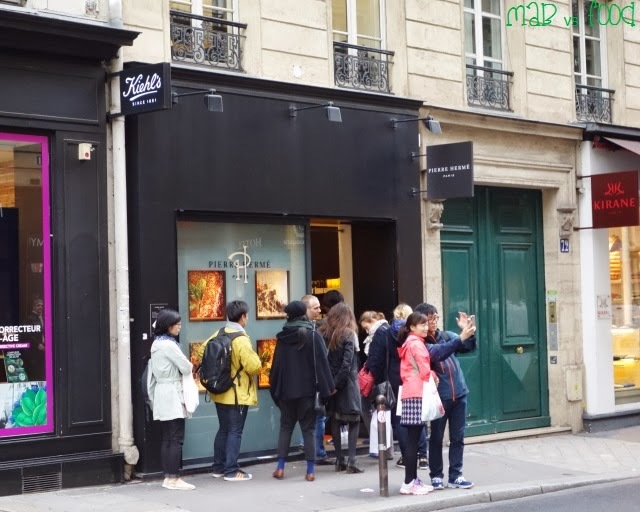 There is just something magical about Paris whether it be the Eiffel Tower, the River Seine, the Impressionist art or just strolling around districts like Marais and St Germain with their Parisian charm. But what I am missing the most is the food. How delicious are the cakes and pastries! 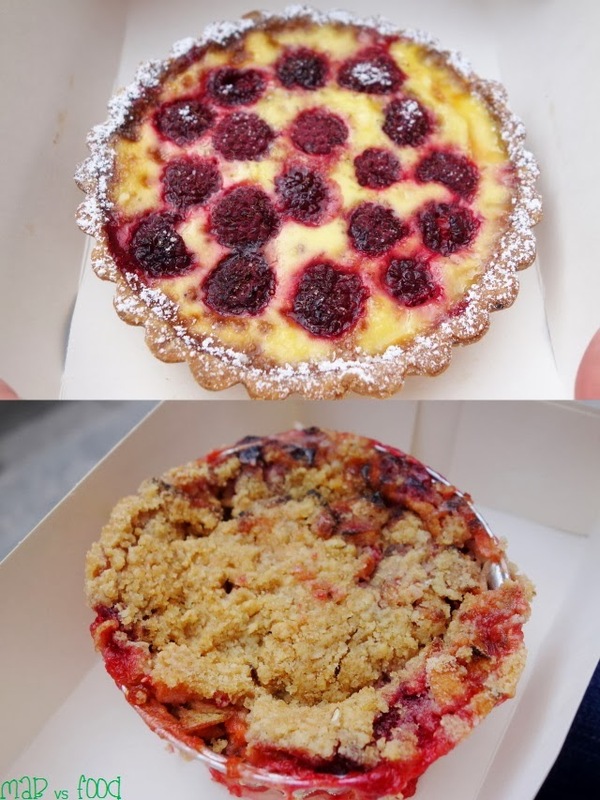 Amongst all the sightseeing, we managed to cram in as many patisseries as my stomach allowed. This meant having several cakes per day, sometimes back-to-back. 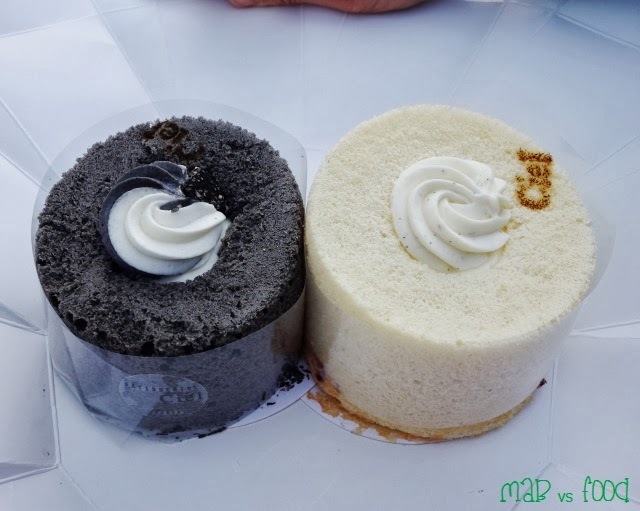 The calorie count was surely going through the roof, but these cakes were impossible to resist! Obviously not a cake nor a pastry, I wanted to include the place where I found my favourite baguettes, Eric Kayser. 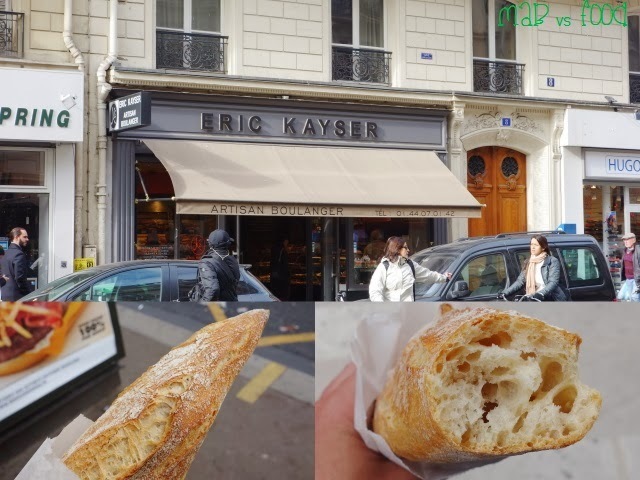 The red-headed Eric Kayser is a world famous bread maker that has built a bread empire that includes 17 boutique stores in Paris and 12 stores in other countries. 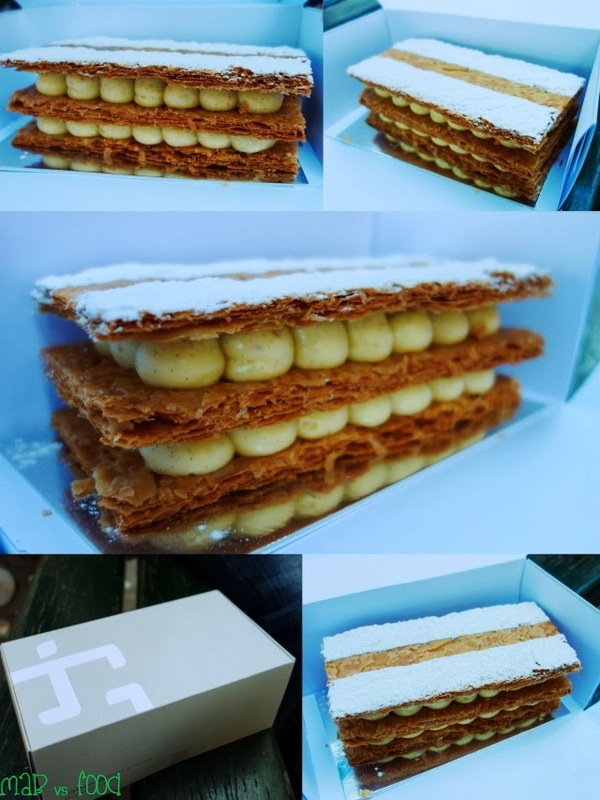 Millefeuille with Vanilla Cream - so good that it needs to have shots from various angles! 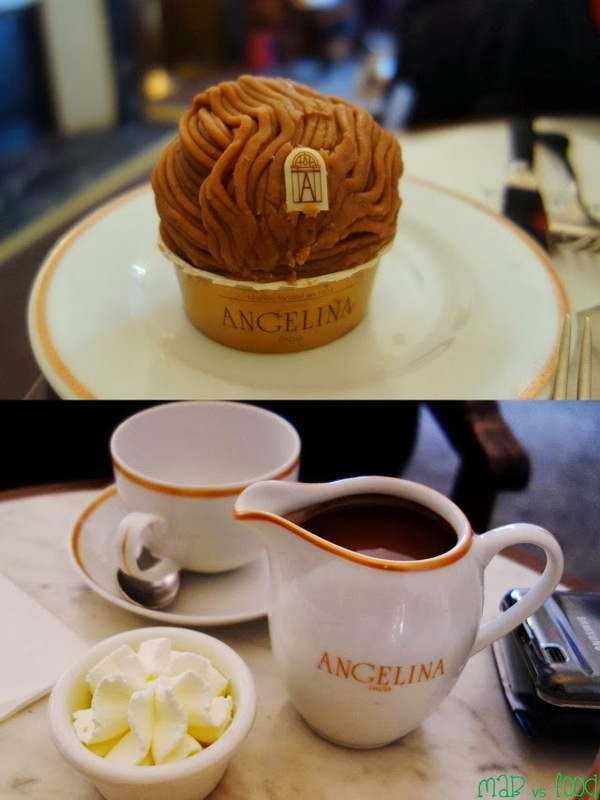 Jacques Genin is a large store and tea salon that sells a range of chocolates, caramels and pastries. 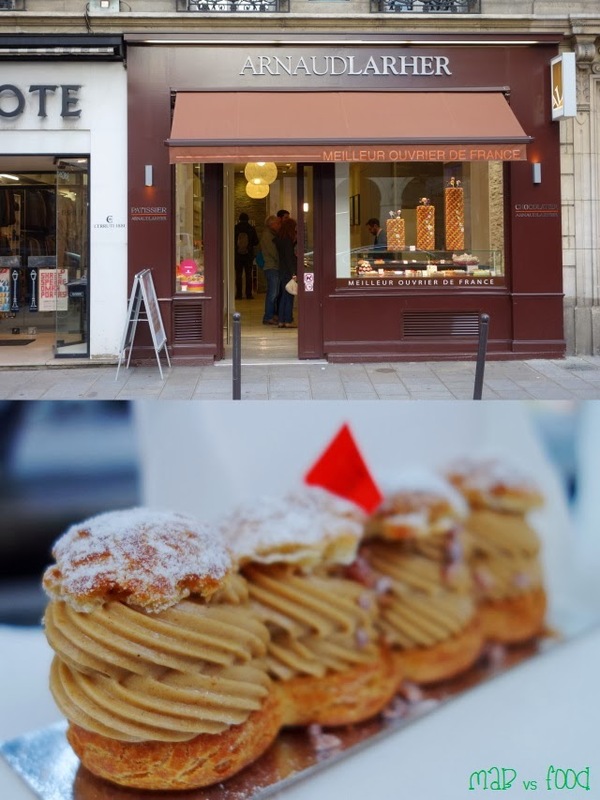 Jacques Genin has a reputation for being one of the greatest classic pastry chefs in Paris. 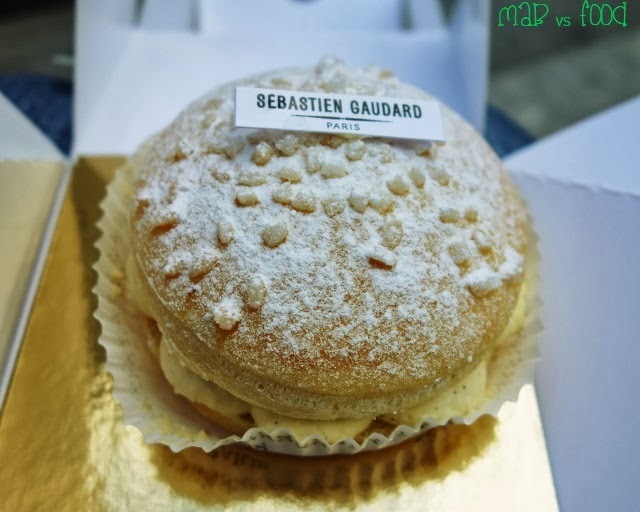 His signatures include chocolate eclairs, chocolate tarts, lemon tarts, Paris Brest and Saint Honore. But I only had enough stomach space to try just one of his pastries after lunch at the 3-Michelin starred l'Arpege. I decided to have the millefeuille with vanilla cream (this is also available with chocolate). It is difficult to tell from the above pics, but the portion is massive. This was a serving for 2 but I think this would be enough for 3, maybe 4. These are made to order, so the pastry is fresh and just incredible! It's crispy, buttery, super flakey and without the slightest hint of sogginess. The vanilla cream was amazing too! So decadent! The combination of that vanilla cream and the flaky pastry is to die for! A millefeuille is an incredibly messy thing to eat at the best of times, with cream and pastry going everywhere, especially if you are given a single fork. This is where my fold-away knife from l'Arpege came in, which all diners receive as a souvenir to take home after their meal. I was able to cut the pastry into small, manageable, bite-sized chunks. 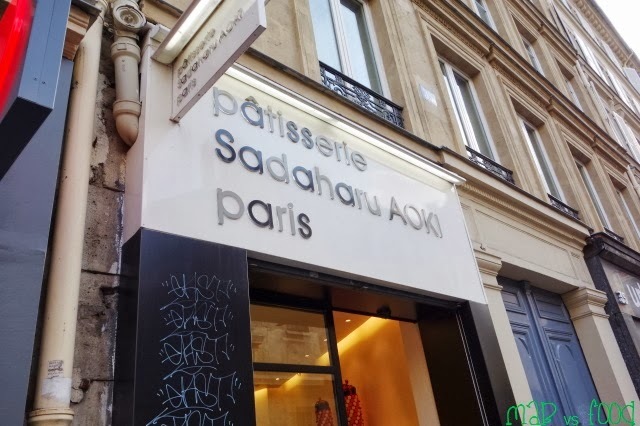 Sadaharu Aoki is a master when it comes to integrating Japanese flavours and ingredients with classic French pastries. Simplicity may be Aoki's motto, but there is incredible finesse in execution. All his creations are beautiful to look at and wrapped in wonderful (and excessive) cardboard packages to ensure your cakes stay pretty. The first thing that my wife and I did after dropping off our luggage at the hotel was to go straight to the basement level of Galeries Lafeyette, where you will find its expansive food hall, with enough goodies to make any foodie squeal with excitement! After I purchased my cakes from Aoki, I headed for the roof level where you can set up a picnic and enjoy the amazing views of Paris. As you can see, I am a matcha green tea freak so I bought two pastries with green tea. 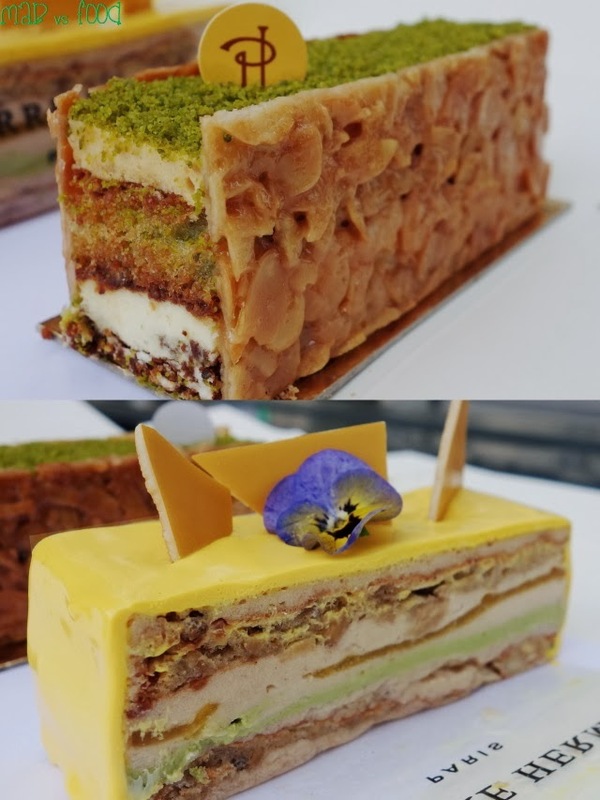 My favourite of the two was the matcha millefeuille. Although not as amazing as the millefeuille from Jacques Genin (nothing is, so that's an unfair comparison), this was a really enjoyable version of a French classic. 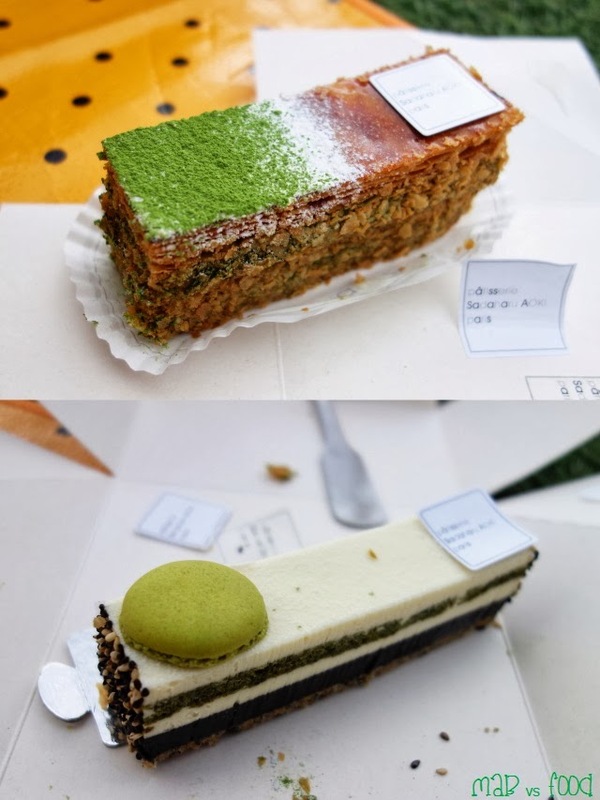 The pastry layers were thin and crispy and the the green tea cream was delicious, moreish and loaded with matcha green tea flavour. My next visit to Aoki was at the boutique store in the Left Bank. 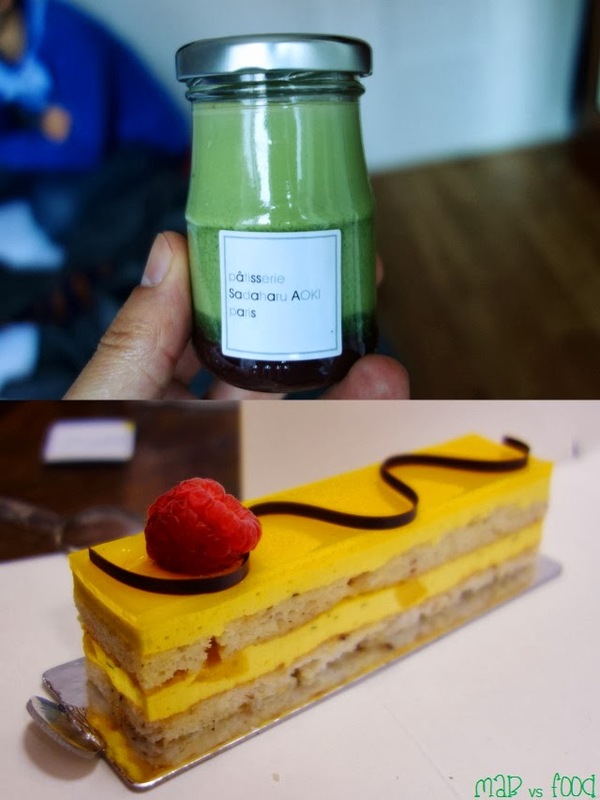 I decided to grab a bottle of creme matcha azuki and a Soleil cake to have back at the hotel. Anything that the Japanese sells in those cute, little bottle has to be good, right? Indeed, the creme matcha azuki was a heaven sent delight! It was basically a French style creme with Japanese flavours. I will never get sick of the classic combination of matcha green tea and azuki red beans. The creme was incredibly delicious, smooth and creamy. Pierre Herme needs no introduction. He is perhaps the most famous pastry chef in the world, with his macarons adored by foodies all over the world. Pierre Herme is not one to be missed, but with numerous stores all over Paris, you will likely stumble into one of his stores. Pictured above is his flagship store in St Germain, which always has long queues. It is as much a tourist attraction as it is a store, as evidenced by the above couple posing for a pic with the store hehe. Our first stop at a Pierre Herme store was at the Public Drugstore on Champs Elysees. Don't let the name fool you, the Drugstore is quite a trendy place featuring a grocery store, an international newsstand, shop for products, jewellery, clothes, alcohol and cigars. It is also the home of 2-Michelin star restaurant, l'Atlier de Joel Robuchon. The purpose of this visit to Pierre Herme was simple: to try his famed macarons. These macarons, for mind, were the best macarons I have had anywhere in the world! The flavour combinations were unique, interesting and pure genius. 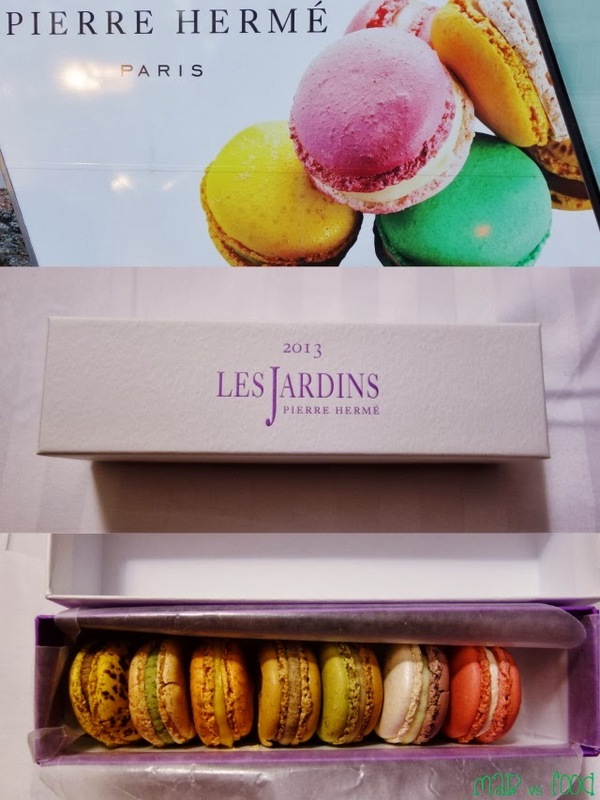 Pierre Herme is known for his use of savoury ingredients such as olive oil and fleur de sel (French salt) and what I enjoyed the most was that the macarons were bursting with flavour and not overly sweet. Next Pierre Herme stop was his flagship store in the 6th arrondissement. After 20 minutes in the queue and lots of indecision, I finally decided on 2 cakes: Ibiza and Sarah. As beautiful as the island Ibiza off the east coast of Spain, is the wonderful Ibiza cake. The cake consisted of pistachio dacquoise biscuit sprinkled over the top, with layers of rich almond genoise, a slightly zesty orange mascarpone cream and a light turron mousse. The crispy almond nougatine surrounding the cake provided a textural contrast. 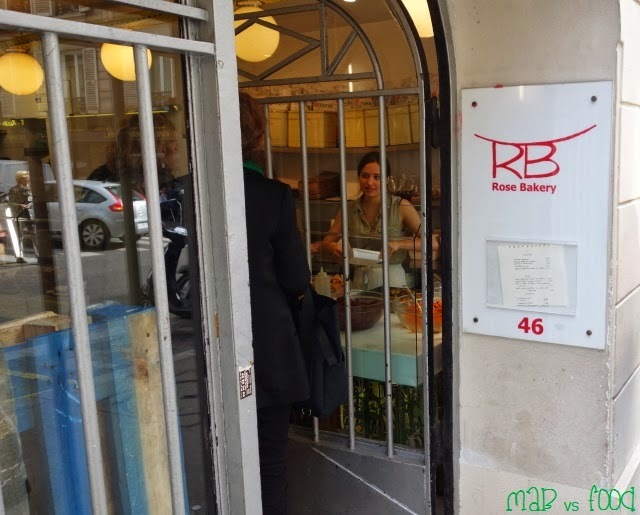 Rose Bakery is a small British cafe and teashop run by a Franco-British couple. The dining room is minimalist and is packed at lunchtime and weekend brunches. 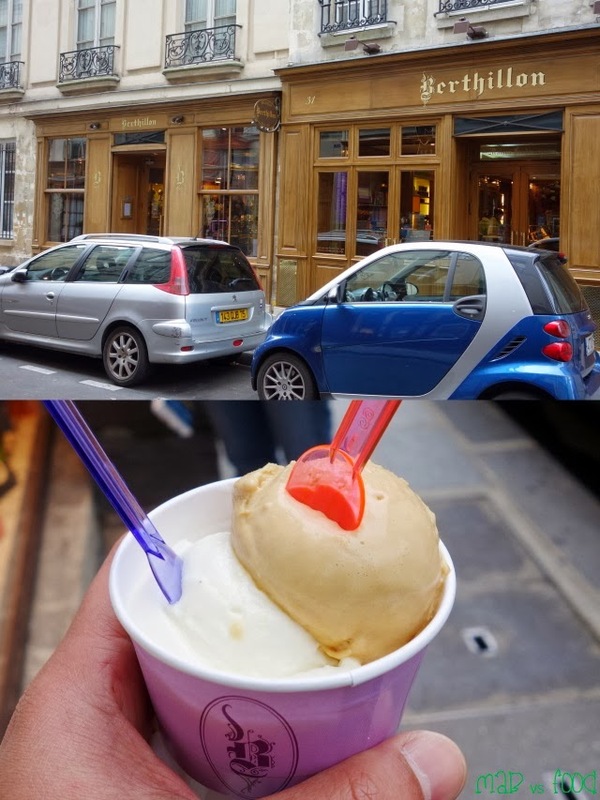 I went to the original store in Rue de Martyrs but there are 2 other stores in Paris. So that's all folks! 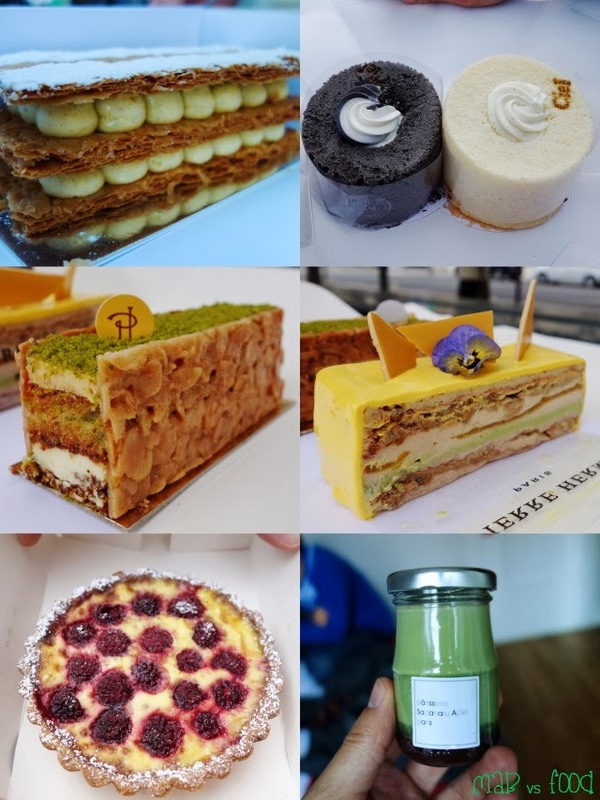 The cakes and pastries I tried in Paris were some of the best I have ever eaten. But I do wonder whether the French or the Japanese are better at making cakes? I love them both so I am going to sit on the fence on this one, to avoid the risk of upsetting anyone :) What does everyone else think?